Texas cops last night arrested a 13-year-old girl in connection with a viral video showing her attacking a classmate who was holding a small child in her lap. The teenager surrendered to police and was booked into the Dallas County Henry Wade Juvenile Detention Center on assault and injury to a child charges. Video of the attack can be seen below. Investigators--who did not identify the defendant due to her age--began probing the girl after video of the June 19 assault was posted online. The attack occurred outside an elementary school in Rowlett, a Dallas suburb, and was the result of a prior disagreement between the assailant and the 14-year-old victim. The victim, who apparently declined demands to fight, was subsequently yanked to the ground by her hair and beat by the 13-year-old. 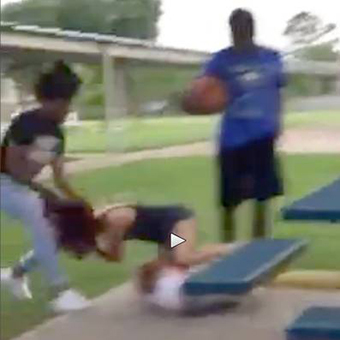 As she was pulled from a bench, the girl’s cousin went flying in the air and landed on a concrete slab. The victim and her cousin suffered minor injuries during the fracas, according to police. The attacker is facing a felony injury to a child rap related to the boy tumbling to the ground. She has also been hit with a misdemeanor assault count for attacking the older girl. None of the other teens present has been charged, including the young jackass who can be seen dancing and gyrating over the victim as she is being pummeled.